It’s been nearly a year since we released Tammy Plotner’s What’s Up 2006. Over the course of the last year, the 400+ page book was downloaded more than 500,000 times. Well, it’s that time again. What’s Up 2007 is now available, and it’s completely free. Once again, Tammy has written a 410-page PDF with suggestions for what you can see in the night sky every day of the year for 2007. The book is huge, more than 23 MB, but that’s because we’ve crammed it full with beautiful photographs and skycharts. So, to everyone who enjoyed last year’s edition, it’s time to spend another whole year looking up. Internet Explorer - choose "Save Target As"
Firefox - choose "Save Link As"
For those of you who don’t want to download the entire book, we’ll be running the entries every day here on the Astronomy What’s Up blog. So you can just come back and visit the website every day. We’ve also got a printed version of the book available for purchase through Lulu.com - it’s only $25.00 USD + shipping. I’m holding a copy in my hands right now, and it looks pretty cool. Thanks to everyone who participated in the book. And a special thanks to Tammy Plotner for writing another wonderful year’s worth of skywatching. 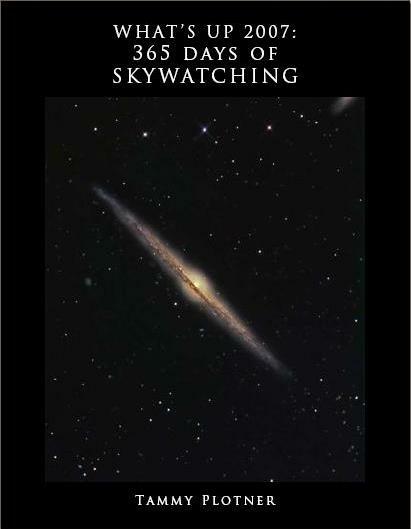 We’re glad to give this book away as a gift to the amateur astronomers everywhere. Now get outside and look up! Copyright © 1999-2006 Universe Today, All rights reserved.